Today is Wednesday March 23 and it is a beautiful day. We have a bright sunny sky with a temperature of 11C which is 52F. First thing this morning we walked to the local butcher shop (boucherie) and purchased a small pork roast (roti de porc), .5kg, about 1.1 lb. That will be dinner tonight. We took the bus to the Carrefour Market which is in the Courtoisville area of Saint-Malo. We took the wrong bus. We took a number 3 bus and we should have taken the number 8 bus. But it only took us about 1/4 of a mile out of our way. First we stopped in at the Gitem electronics store. Sandy would like to dry her hair before heading out in the morning. So, we are shopping for small travel size hair dryers. She got one for 19€. We then crossed the street to shop for some items a the Carrefour Market. A “Market” is larger than a “City” which is what we have in the Intra-Muros. But much smaller than a Hypermarche which is in the Madeleine shopping center. We purchased butter, yogurt, grated parmesan cheese, orange juice, chocolate mousse, milk, and granola. Most of these items are not available at the local markets. All of the grocery items fit into one of our reusable shopping totes. All stores charge for plastic bags in France (except for an outdoor vegetable market) so we always bring our own. We then crossed the street to the bus stop to take the number 8 bus back to the Intra-Muros part of the city. Phil stopped in to buy a newspaper, Ouest France (West France). It is the regional paper. 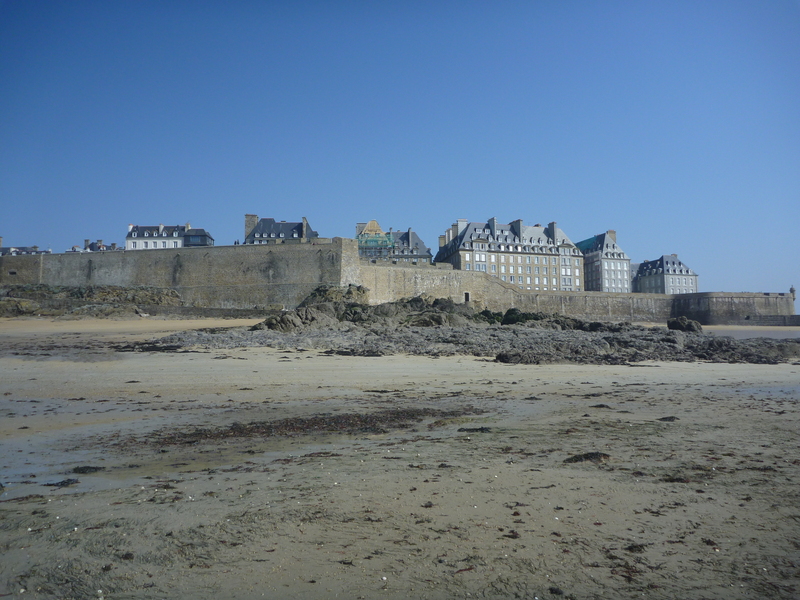 It also contains news and articles for our specific area, Saint-Malo. After lunch we put on an extra pair of socks, our new rubber boots and headed to the ocean. We wanted to try out the boots in the ocean and to have some fun in the water. 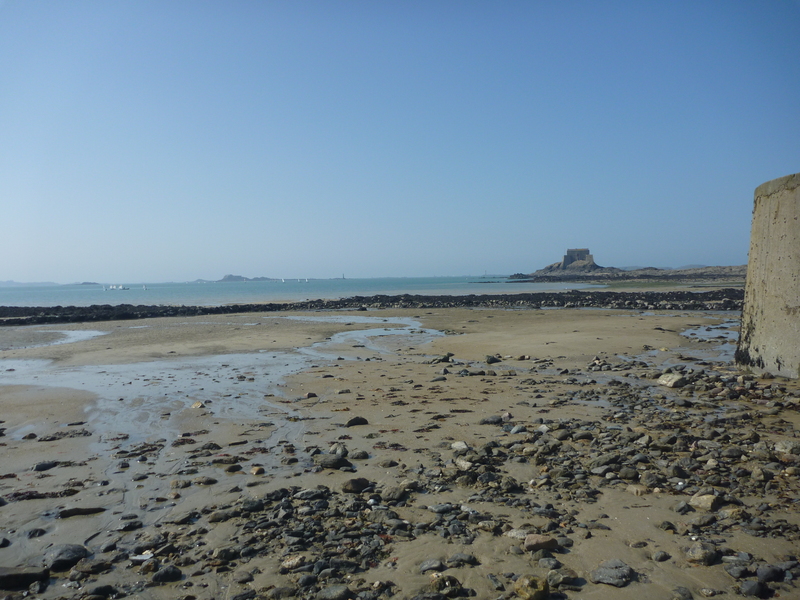 It was low tide, so we had to walk out quite a bit, a couple of hundred yards away from the city walls. Wearing the boots was just fine. We did end up in some muddy areas where we had to watch our step so as not to fall. Without the boots we would not have ventured so far out. While we were walking in the water, we saw a man working by a low wall of stones. He was carrying a plastic bucket. 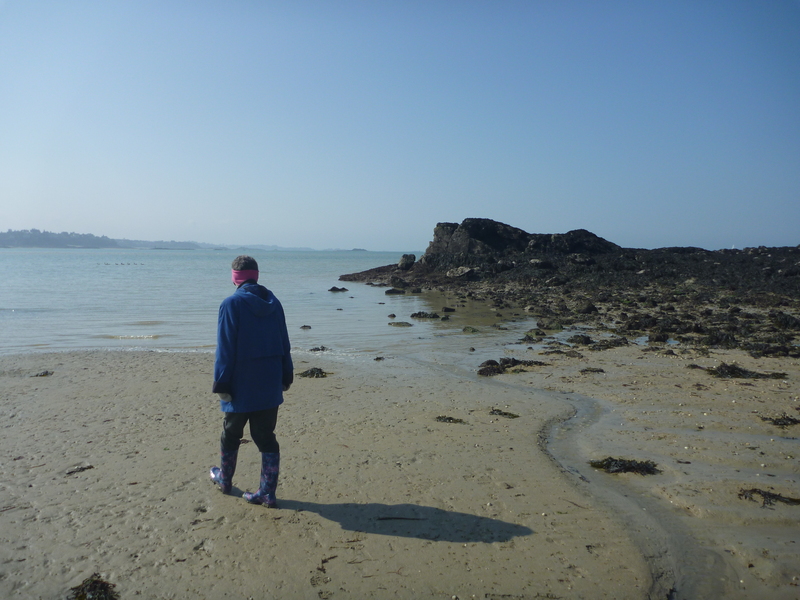 During low tides like this many people head out to search for crabs, mussels, etc for their eating pleasure. So Phil asked him what he was searching for. He replied that he was not searching for any sea creatures, rather he was out there working on maintaining the low wall of stones. 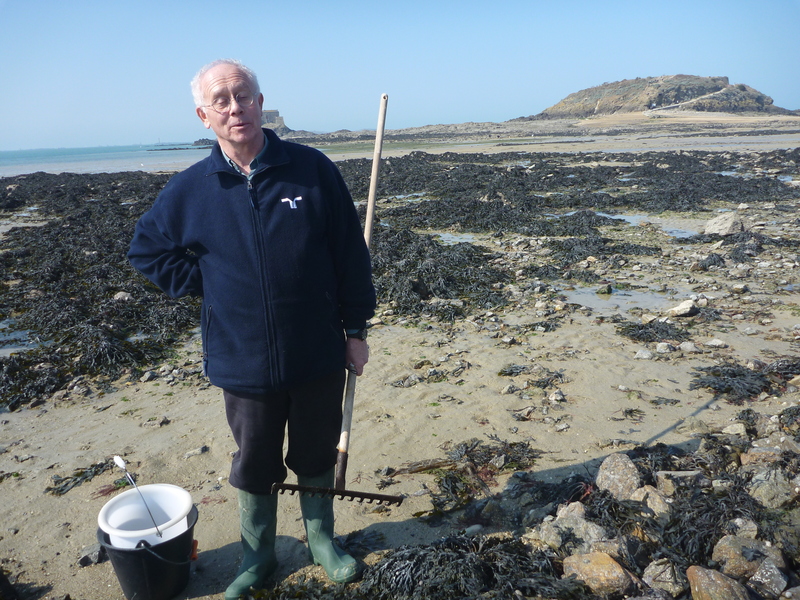 He said that he and a friend had constructed the wall to help create a protected environment for the small sea creatures which come and go with the tides. He also showed us a catch basin he had created which trapped debris, such as plastics and glass, from getting to the ocean. He then polices the area to get ride of the unnatural debris. A very interesting guy to run across a couple of hundred yards from the ramparts. We were really lucky to have time to talk with him. On the way back we found that our boots had very little sand on them, which was good. A little rinsing off in the sink and they were as good as new. 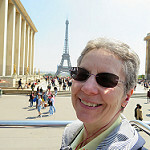 Just got off of a phone call with my cell (mobile or portable) service provider here in France, Réglo Mobile. A week ago, I had purchased a new SIM card for my old French cell phone. Réglo was calling to verify some information and to set in place a monthly credit card transaction for the service. Phone calls in French are very difficult for me and I try to avoid them. However, this was the fourth time they had called in the last 2 days, so I decided to get it over with. The customer service man on the other end of the line started in speaking normal French. This is usually fine for me as long as I am face to face with the person, but on the phone it was too quick. So I asked him to slow down. He was very nice and did slow down. We spent the next 10 minutes getting everything verified and in place. So it ended up being a good call for me. The pork roast for dinner was very good.